Air Hockey Table FBX for your level design. An accurately modelled UK Public telephone. Three arcade machines for your level design. A 1980s Retro television for your level design. 10 pieces of Furniture for your game. Your fate is in the hands of other players. Happy with all the cupboards, drawers and layout. I'm quite proud of this sink. I've started added kitchen units. Next job is to texture all of the units and handles. 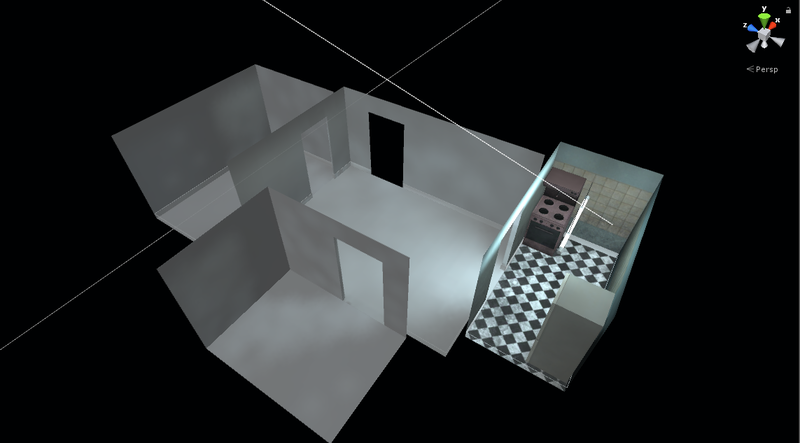 Apartment interiors - I've started building the interiors of the apartment buildings. This (I think) is going to be the start position of the game and will contain plenty of items you'll need for the rest of your journey. As you can see, I've started work on the kitchen. The living area is the large room in the centre. Next to the kitchen is the bathroom and a bedroom opposite the kitchen. I'm using the fridge from First Winter but still need to add animation, so you can open the doors and loot the shelves. This is also from First Winter, however I've added a grill on the top and re-textured it to look more grotty. A shot looking out of the kitchen. In the distance you can see (what will become) the bathroom. This is where I'll post updates about the progress of the full version of the game. Look out for screenshots, GIFs and perhaps game play videos. Ah thanks man. I’m so glad to hear you enjoyed it. It took a lot of work and time. I am still developing obscure type games but I start 50 projects and only finish one. I’m working on a few things at the moment. I’m using C# for all my game work. Thank you for taking the time to give it a go. I enjoyed watching you're play through. Happy new year! Thanks for the kind words. Glad you enjoyed playing the demo. Thanks for the video. What a lovely play through. Thanks for taking the time to give it a shot man. Enjoyed watching you play it. Cheers. This sounds like a really well thought out game. I like the idea of barricading yourself in. It's something I've played around with a lot and although it doesn't feature too much in this little demo, it is going to be a feature of the larger game! No longer than 3 hours. The time starts in the next 1 hour which doesn't actually begin until 10 minute passed the previous 2 hours. I’ll upload a 32 bit shortly. Glad you enjoyed it. Hopefully you’ll be excited about a full version when I get the time to finish it off. Please consider leaving the game an itchio rating. Thanks again. Thank you. Such kind words. Puppet Combo is a great influence on my work. I mentioned PC along with 98Demake and Christophe in the opening credits. 😉 Please consider leaving me a rating if you enjoyed. Thanks again. Thanks for the rating buddy. Love your video. Sorry about the mouse not locking. I actually addressed that issue a couple of weeks ago so I guess you must be playing an older version. Sorry about that. Thanks for the video. I'm glad you enjoyed it. Please consider leaving the game a rating; it really helps drive more people to the demo. Good luck with your YT channel! Thanks for the video! Glad you enjoyed the teaser. Despite not catching the controls you seemed to pick it up pretty quickly. Please consider leaving it a rating if you enjoyed it. Cheers mate. Thanks Will and sorry for taking so long to reaspond. I loved your video. I’m super excited to work on a larger version of the game. Please consider leaving a rating if you get a chance (and haven’t already). Thank you for playing my game. I hope you enjoyed it. A little rating would be greatly appreciated. 👍🏼 Thanks again. Thanks Drunken Cat. Glad you enjoyed it. If you haven’t already please consider leaving the game a rating. Thanks again. Thank you very much. Kind words. I’m really keen to take this teaser further and expand into a full game. Thanks for the video. Please take a minute to leave the game a review if you get time. Thanks again. Obviously a Romero fan! I hope you enjoyed it. An interesting concept for you YT channel. Thanks for playing. If you have time please consider leaving the game a review. It really helps. Many thanks. Danke Rostiger. Du bist mine 1st YouTuber. “Pacific” zwei jare ago. My German is terrible 🙂 🇩🇪 Please if you enjoyed leave th game a rating here on itchio. Many thanks. Thank you! I hope the future direction doesn’t disappoint you. I’m really excited to move this forward and have already built quite a lot more. If you’re happy to do so (and haven’t already) I love you to leave the game a rating. That’d be just awesome! Thanks Xtella! Glad you liked the style. Did you leave the teaser a rating? I’d love to get a few more stars! Many thanks. 2am is a brave time to play this! Thanks for giving it a shot. I’m glad you’re excited about a full version. If you liked this teaser please consider giving it a rating on itchio. It really helps the games reputation. Thanks again. You win the prize for the best door reaction! Thanks for playing the teaser and look out for the full game whenever I get round to making it! I’d really appreciate a rating on itchio if you get the time. It really helps me out. Cheers Jonny. Thanks for taking the time to play my little teaser buddy. A couple of jump scares in there 😉 Thanks again, giving it a rating if you get a few mins pretty please! I’m really excited to work on a fuller version of the game. I’m sure you’ll enjoy it. Thanks a lot for making this video. I’d really appreciate a rating if you can spare a couple of minutes. Every little helps!! Thanks Steve. Great video. I’m glad you enjoyed it. If you’ve got time I’d appreciate it if you could leave the game a rating for what you think it deserves. Many thanks! Thanks a lot for giving a try. I enjoyed watching your video. The atmosphere is definitely a teal focus of mine. I’d be grateful if you could the game an itchio rating if you haven’t already. Thanks again. Awesome! I’m glad you enjoyed the atmosphere. That was my main focus. Hey Modus. You're not being dense, well maybe just a little bit :) You need to find something to stand on to reach those other screws. Perhaps the screw driver can unscrew other screws?